I pride myself in making my home toddler friendly. I have 2 year old twins, and I want them to have a safe, inviting environment to explore, create, and play without me having to constantly hover and say "no, don't touch!" Of course, this means we made some changes to our home over the past couple of years. Our breakfast room became a playroom. Our slate topped iron coffee table was packed away to the basement for a softer ottoman. Our sofa was covered in a washable slipcover. Gates keep certain areas off limits. You know the drill. We had a good thing going until December rolled around and we plopped a big, brightly lit tree in the middle of the living room, hung what appeared to be small toys from the branches, put a gate around it and told my toddlers not to touch. Ha! I carefully picked which ornaments we put on the tree, knowing full well that they would be touched, most likely picked off, and possibly thrown. My boys are 2, and they are curious and quite active. We are working on the throwing but it's definitely a work in progress. I picked ornaments made out of plastic, without too much sentimental value, and thought we would be OK.
Four days in, and we had 4 broken ornaments. Who knew that even though they were plastic they were still quite breakable, especially with rough little hands. We had gone through several rounds of "don't touch! put that back! no! time out!" All of us had cried at one point or another. I put the boys down for their nap, made a cup of coffee, and sat down to look at my tree. I had moved all the ornaments out of reach, so about half the tree was bare. And I put myself in my kids' shoes. In the midst of the MOST exciting time to be a kid (parties! cookies! Santa!) I had placed this huge temptation right smack in the middle of the living room and asked them to restrain themselves. In the very place that I had worked their whole lives to make comfortable and kid-friendly. That just didn't sit well with me. Yes, they need to learn self control, and restraint, and for goodness sakes not to throw things. But now, at Christmas? In the place where they should be able to play? Nope. Then I got an idea. I found a box and took all the ornaments off of the tree. Then I grabbed the big bunch of Christmas shapes that I had cut out of felt and craft foam for our No Mess Christmas Collage the week before. 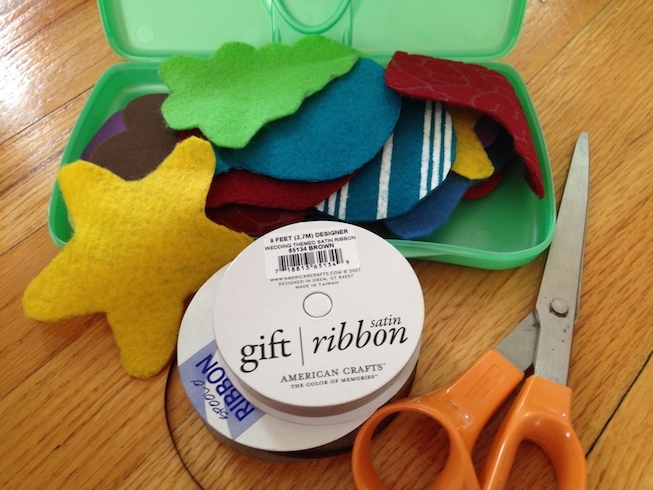 I got out my scissors and some ribbon and went to work. I cut a small slit in the top of each shape, slid some ribbon through, and tied it in a loop. Voila! 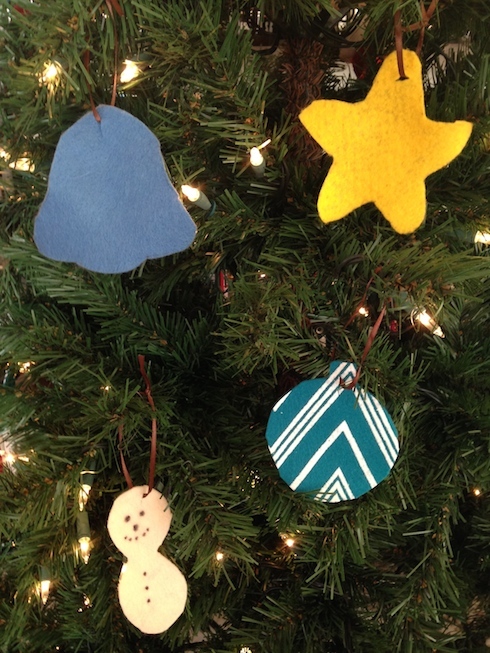 An assortment of soft, toddler safe, cheap, and unbreakable ornaments, just ready to be hung on the tree. When the boys woke up, I told them I had a surprise. We were going to decorate the tree, and use ornaments that we could touch! They loved it. OK, so my felt ornament decorated tree isn't beautiful, but it couldn't be more perfect for my house. If one of my toddlers wants to touch or grab one of the ornaments, no big deal. Nothing is going to get broken and no one is going to get upset. Interestingly, now that the tree isn't totally "off limits" (it's still behind a gate so it doesn't come crashing down!) it seems to have lost some of its tempting appeal. And we are still going to work on restraint and for goodness sakes, the THROWING, but I can do it in a calm, reassuring way that will allow my boys to learn and grow in a nurturing way. 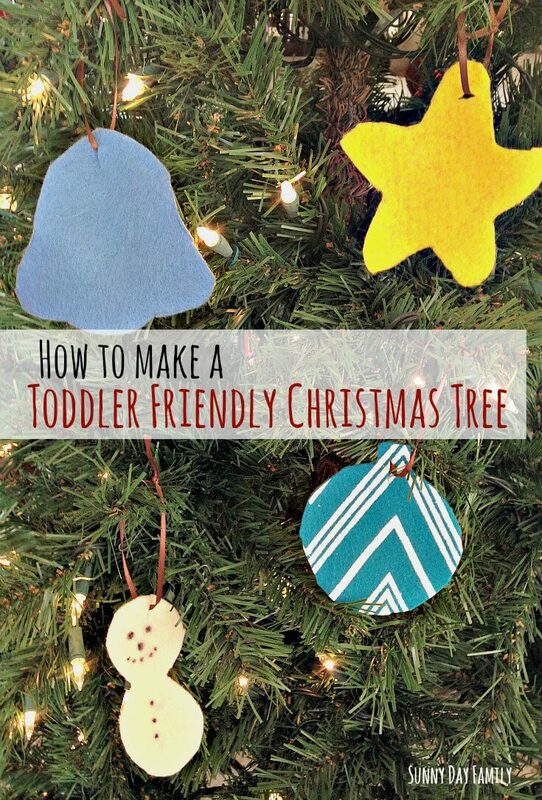 So if you're out there, making yourself completely crazy hovering over your toddler and protecting your Christmas tree, I encourage you to give this idea a try. Christmas is all about peace and harmony, right? So why not start in your own home and give yourself (and your little ones) a break. You might just enjoy Christmas a little more. What a wonderful idea! We have been making a lot of ornaments and hanging them. I love the idea of making things kid friendly. Stopping by from the link up! Love this idea! I usually put all their or ament on the bottom of the tree. After reading this I just realized that they don't want to play with it anymore now that they have free range to touch it. good thinking!! Thanks for sharing on our fb page!